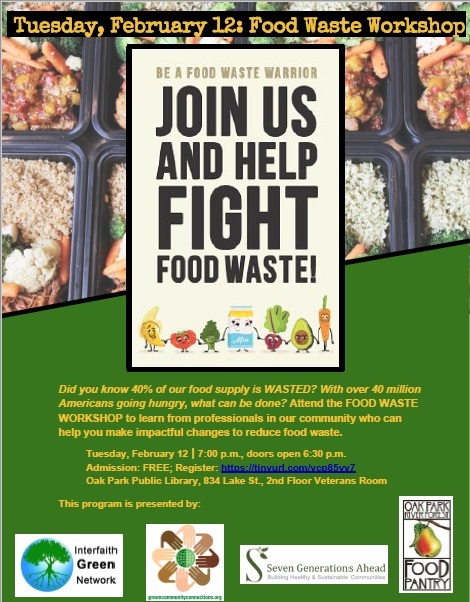 Residents are invited to a Food Waste Workshop to learn about what is being done in Oak Park/River Forest to address the problem of food waste. Representatives from the OPRF Food Pantry (Food Rescue & Surplus Project), Seven Generations Ahead, Village of Oak Park, Oak Park River Forest High School, Green Community Connections, and more will share their knowledge and resources with participants who will learn actionable steps on how to make impactful changes in their lives and at home. The Interfaith Green Network (IGN) is a faith-based sustainability initiative made up of 20 area congregations. Partnering with One Earth Film Festival, Green Community Connections, Seven Generations Ahead, OP/RF Food Pantry, Village of Oak Park, and Sugar Beet Co-op, IGN is working to help make residents more aware of the problem of food waste and how each of us can become part of the solution.